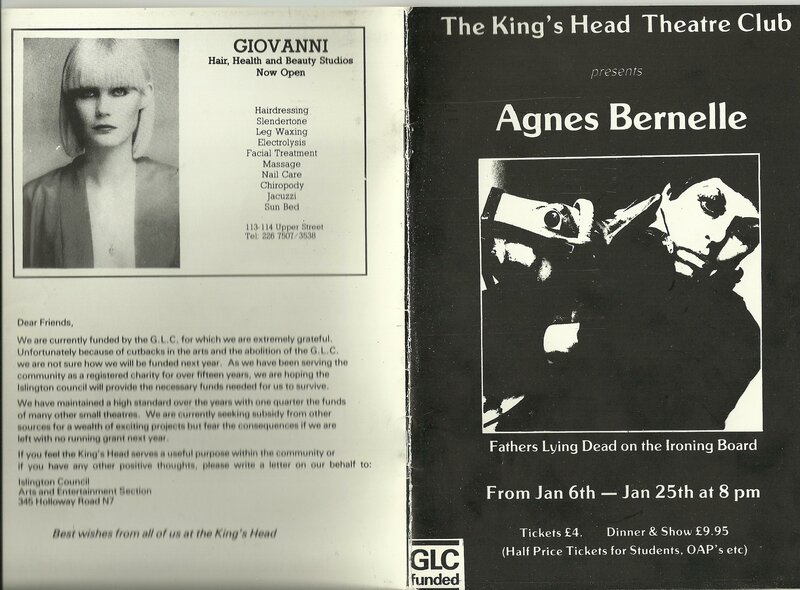 All music by Michael Dress, except ** traditional, adapted by Agnes Bernelle. Enter stage left, a lit cigarette. As the light comes up, a cloud of exhaled smoke announces Agnes Bernelle’s arrival. Everything this lady does is invested with a mock theatrical flourish, from her on stage movements to her sparkling delivery. 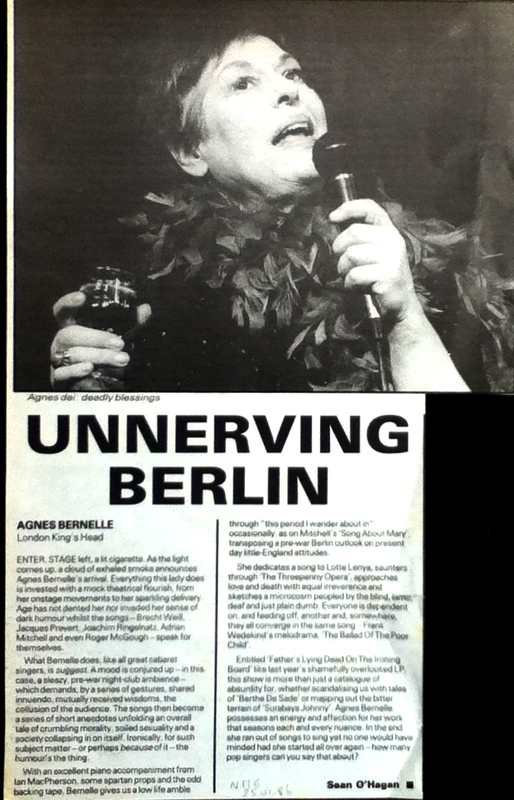 Age has not dented her nor invaded her sense of dark humour whist the songs – Brecht, Weill, Jacques Prevert, Joachim Ringelnatz, Adrian Mitchell and even Roger McGeough – speak for themselves. What Bernelle does, like all great cabaret singers, is suggest. A mood is conjured up – in this case, a sleazy pre-war nightclub ambience – which demands, by a series of gestures, shared innuendo, mutually received wisdoms, the collusion of the audience. The songs then become a series of short anecdotes unfolding an overall tale of crumbling morality, soiled sexuality and a society collapsing in on itself. Ironically, for such subject matter – or perhaps because of it – the humour’s the thing. With an excellent piano accompaniment from Ian MacPherson, some spartan props and the odd backing tape, Bernelle gives us a low life amble through “this period I wander about in” occasionally as on Mitchell’s ‘Song About Mary’ transposing a pre-war Berlin outlook on present day little-England attitudes. 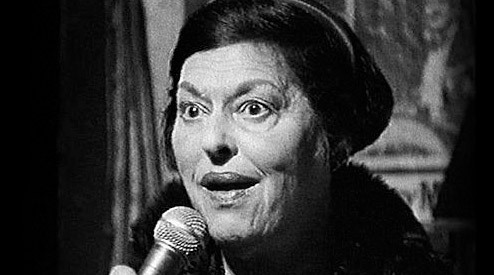 She dedicates a song to Lotte Lenya, saunters through ‘The Threepenny Opera”, approaches love and death with equal irreverence and sketches a microcosm peopled by the blind, lame, deaf and just plain dumb. Everyone is dependent on, and feeding off, another and, somewhere, they all converge in the same song – Frank Wedekind’s melodrama, “The Ballad Of The Poor Child”. 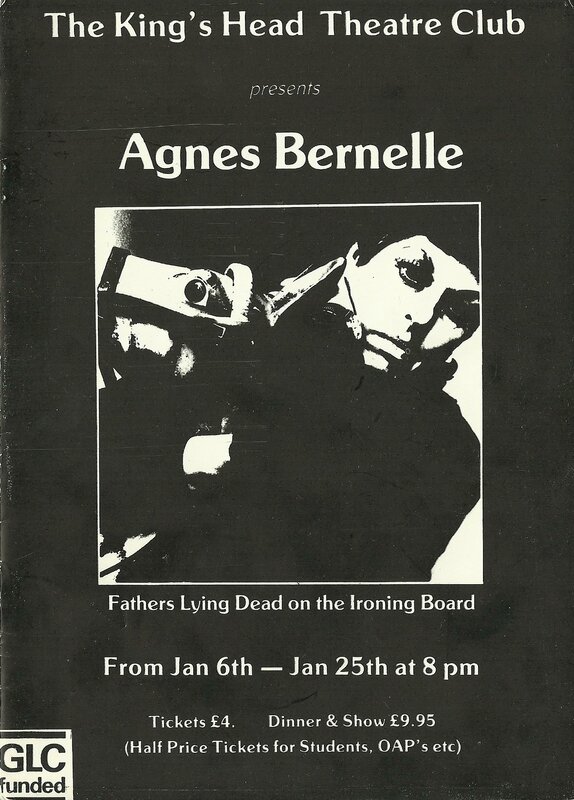 Entitled “Father’s Lying Dead On The Ironing Board” like last year’s shamefully overlooked LP this show is more than just a catalogue of absurdity for, whether scandalizing us with tales of “Bertha De Sade” or mapping out the better terrain of “Surabaya Johnny” Agnes Bernelle possesses an energy and affection for her work that seasons each and every nuance. In the end she ran out of songs to sing and yet no one would have minded had she started all over again – how many pop singers can you say that about? 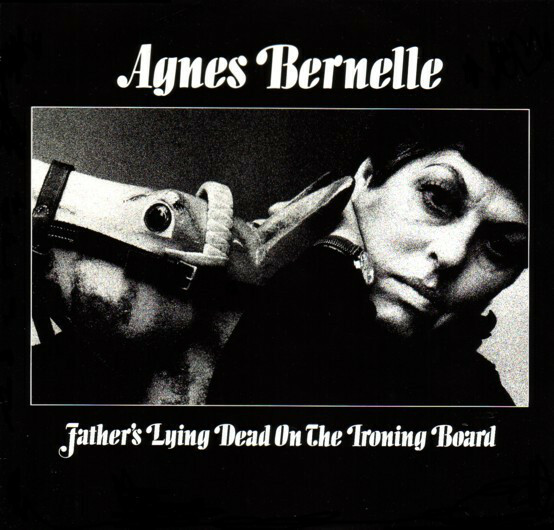 The title of Agnes Bernelle’s cabaret show, Father Lying Dead On The Ironing Board, comes from a song by the pre-war German writer Joachim Ringelnatz, whose lyrics, translated by Miss Bernelle and set to music by Michael Dress, evoke the grotesque half-world familiar from the Brecht/Weill canon, a twilight zone graced by absurd death. This indeterminate, timelessly appealing back alley of the human soul must always be rendered in different shades of black; the colour of Miss Bernelle’s hair, of her dress, of the fringed black cape with ruched collar (“These are my sinister clothes”) and of the darkness from which she first emerges, betrayed only by a glowing cigarette end, to whistle and then sing Brecht and Weill’s “Mackie Messer”. The single splash of luridness she allows in her props (as distinct from in her lyrics) consists of the vivid turquoise boa she adopts for “The Old Bilbaoan”, a marvelous plangent song about nostalgia and faded romance which on Monday found the elements in sympathetic mood, with the mad beasts of the night flapping about on the theatre’s roof at the instant the singer reached the part about “that old ceiling”. 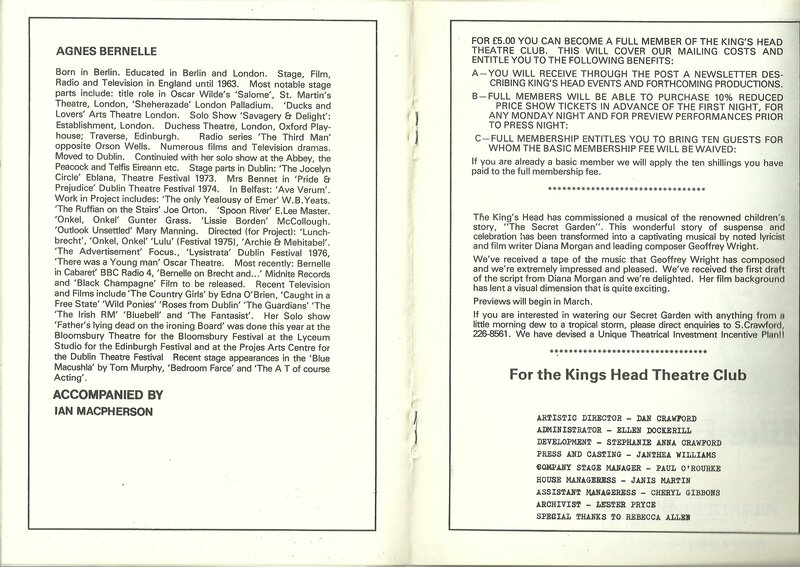 Other material by Wedekind, Prevert and Klabund is complemented by songs and poems by Adrian Mitchell and Roger McGough, which hark back to the success Miss Bernelle enjoyed at the Establishment Club in the early 1960s. The road from her Berlin childhood has taken in a busy acting career, and it is through her expressions and gestures – pathetic, bitchy, embarrassed or lewd – that she brings her repertoire to life. Her voice begins the evening rather flat and tending to uncertainty in the sustained notes, but, once she dispenses with the over-amplified microphone, the smoky warmth comes through to wrap itself round Ian Macpherson’s judicious piano accompaniment.